So much cuteness!! Adorable baby fairies take a bath, play hide and seek, slide down a mushroom, fly with a bird, and finally fall asleep on their rose petal beds. Their cute little wings are just as unique and bright as their own little fairy selves. Each baby fairy is diverse and colorfully dressed. Such sweet illustrations with pretty little details will keep any child interested looking for butterflies, inchworms, and ladybugs on each page. The plant-life gives the perfect background for this fairy world with acorn hats and leaf showers for the tiny folk. 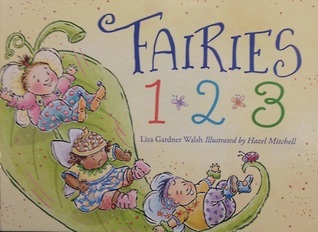 A charming board book that teaches little ones to count, and play and fly with the fairies! Disclaimer: I received a copy of this book from the publisher in exchange for a free and honest review. All the opinions stated here are my own true thoughts and are influenced by anyone.